We hope all of our readers had a happy Hanukkah. We celebrated the holiday in Jerusalem, where the sufganiyot (filled donuts) won a lopsided victory over the latkes. Now, as we put our Hanukkiot away until next year, it's time to wish our Gentile readers and friends a Merry Christmas. 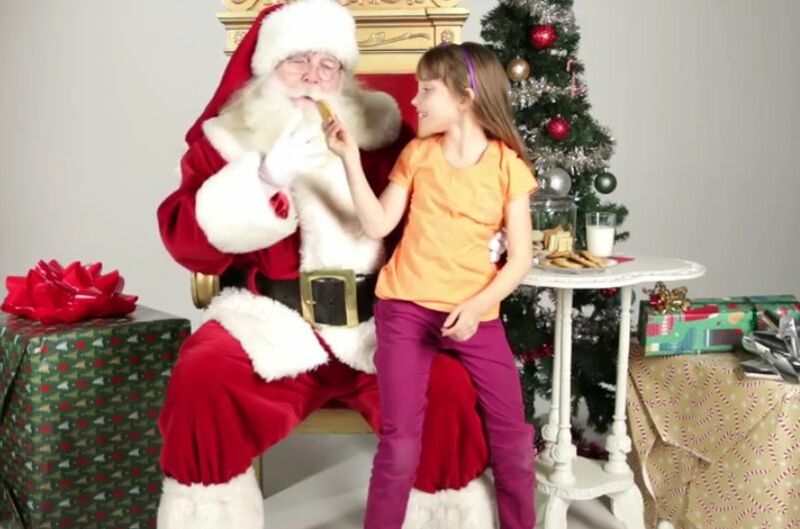 Most large department stores in major cities have been featuring a Santa Claus encounter for the children who accompany their parents shopping for gifts. The funny folks at BuzzFeed video set the stage for some Christmas eve humor by getting a bunch of cute and precocious Jewish kids to meet Santa for the first time. The kids are skeptical, reluctant, outspoken, and adorable. As a member of the August body of Santa Klezim, I resent this clip since it trivializes both holidays, Xmas and Chanukah. Humpf. the little girl part of a cookie that he has already bitten into? YUCKKK!! Just the thought of this video is disgusting. We have the holiday of Chanuka because we did not want the Greeks to assimilate us and to have us Jews assimilate their culture. Is this not exactly what you did? What's next? Jews celebrating Hitler's (ymach shmo) birthday? Pretty stupid. What was the point? Jewish kids know and appreciate who they are.